Motion occurs when an object changes its position. Both Distance and Time are important in describing motion. Relative motion: when two objects are moving in a plane (either in same direction or opposite) each have relative motion with respect to second. e.g. a person sitting in a train and watching a tree, in this case tree is stable but is assumed to be moving but with respect to train. Displacement: How far and in what direction an object has moved from its start position. i.e. 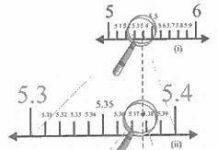 the direct distance between two points. Instantaneous speed: speed at any given time. Storm is moving at 20km/hr. Should you be seeking shelter? Suppose two trains are going with the same speed in opposite direction so they are having different velocities. Race car going around an oval track might have constant speed, but different velocities at each point. Any change in velocity over a period of time is called acceleration. The sign (+ or -) of indicates its direction. + sign shows the acceleration and – sign shows de-acceleration. Images of car are equally spaced. 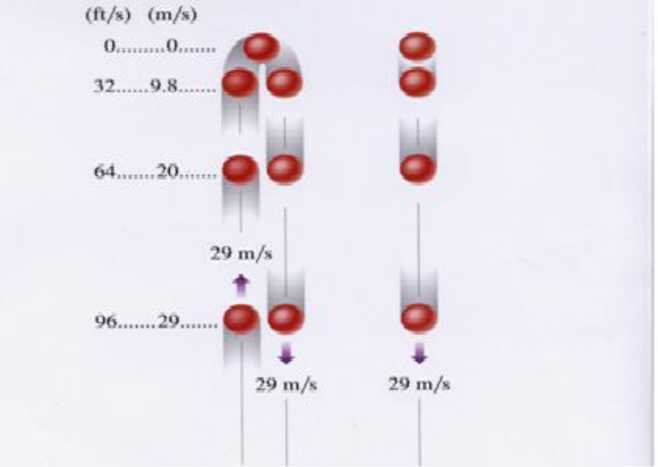 The car is moving with constant positive velocity (shown by red arrows maintaining the same size) . g varies with latitude, height and depth from earth surface. Give the equation for uniform motion. When a car stops after applying brakes, what is the final velocity? In this kind of motion the object moves on circle with fix speed but the direction is changed by the time so the velocity of the change so its called acceleration motion. This acceleration is called centrifugal acceleration. It is directed toward the centre. What remains constant in uniform circular motion? What changes continuously in uniform circular motion? 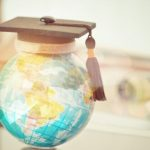 Can displacement be zero even when distance is not zero? 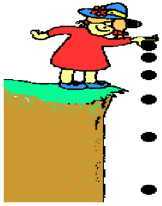 Can the distance travelled by an object be smaller than magnitude of its displacement? A particle is moving with uniform velocity. What is its acceleration? How can you get speed of an object from its distance – time graph? How can you get distance of an object from its speed – time graph? A brick & an elephant are in free fall. What is common in their motion? When an object is thrown vertically upwards. What is its velocity at the highest point? 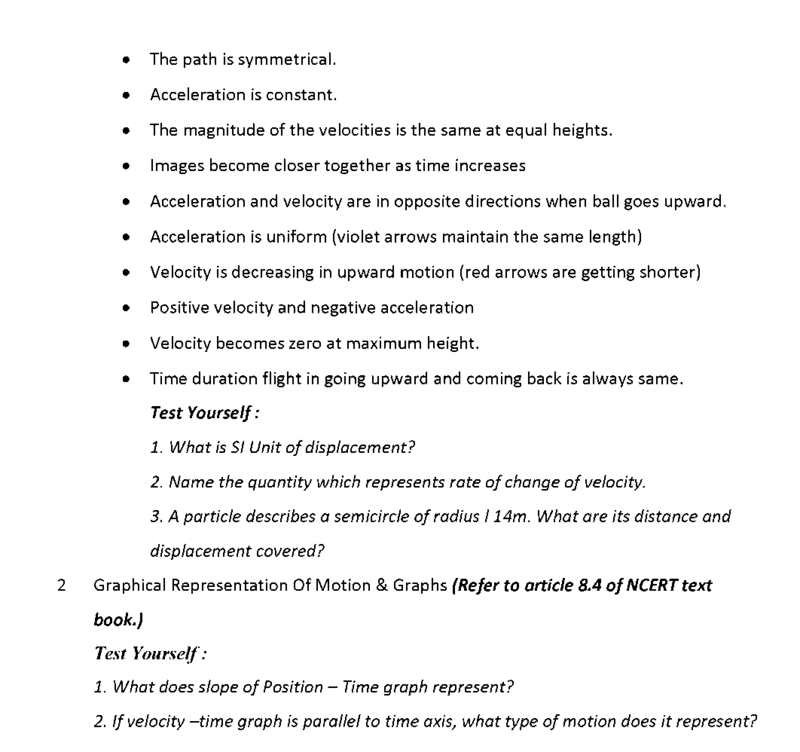 Can velocity & acceleration point in opposite directions? What is non uniform motion? What is retardation? How does it affect the speed? Can speed of a body vary with its velocity constant? Explain. Why is circular motion with constant speed called accelerated motion? State the difference between distance & displacement. What is the difference between speed & velocity? What does a speedometer & odometer indicate? If an object is thrown vertically upwards with speed 49 ms-1. 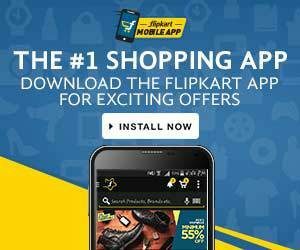 How long does it take to complete upward journey? What maximum height does it achieve? An object starting from rest covers 20 metres in first 2 seconds & 160 metres in next 4 seconds. What is its velocity after 7 seconds from the start? 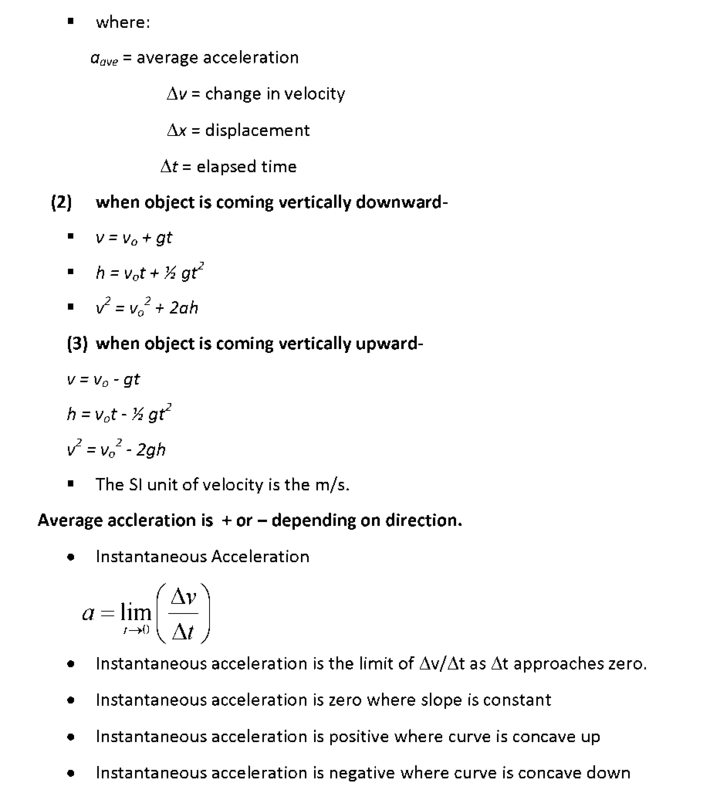 Derive all the three equations of motion for uniform acceleration using graphical method. A car a moving at rate of 72km/h and applies brakes which provide a retardation of 5ms-2. How much time does the car takes to stop. How much distance does the car cover before coming to rest? 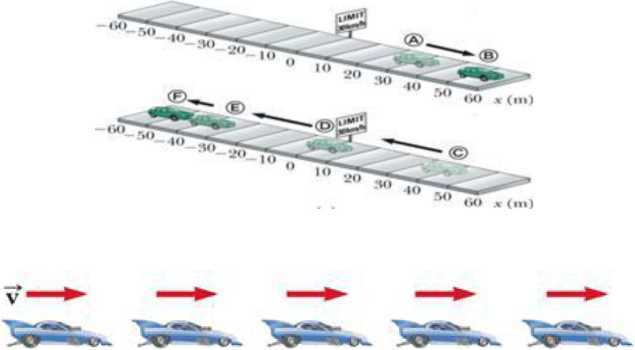 What would be the stopping distance needed if speed of the car is doubled?